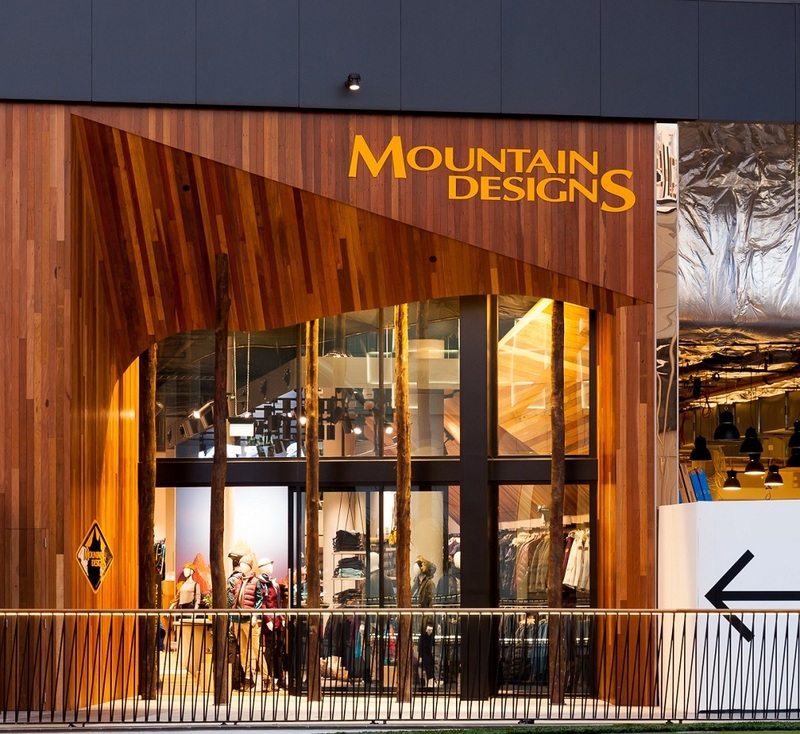 This unique retail store for Mountain Designs creates a dynamic premium retail space that appeals to a variety of customers and showcases world class standards in retail design and fitout. 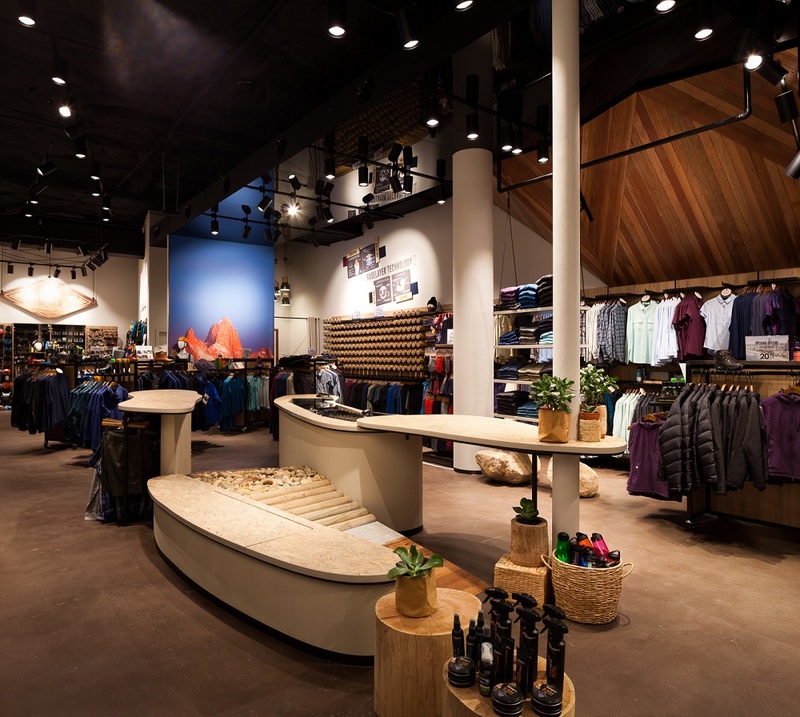 The design, creates a retail destination for Adventure seekers that aligns aspirations of both customer and retailer. 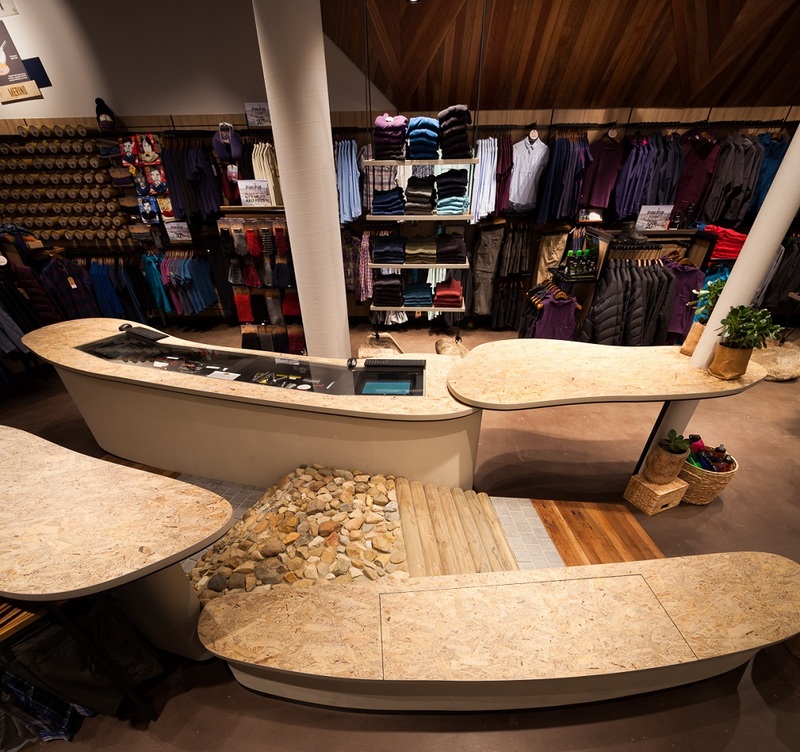 The shop fitout presented some challenges, which were embraced and delivered successfully by JBM Projects. These included a unique shopfront design constructed from recycled mixed hardwood timber, sourced locally on the Gold Coast. 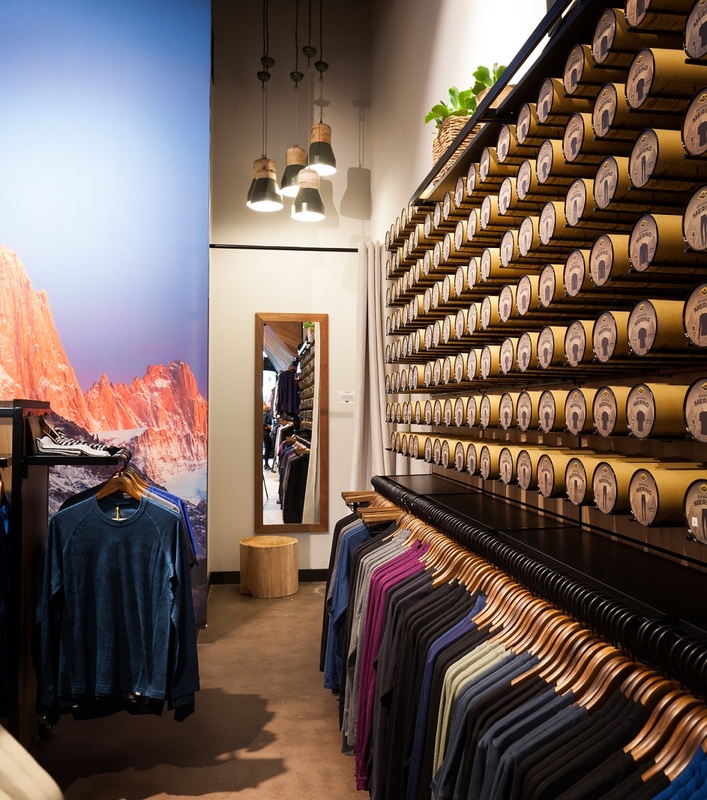 This feature continues along one side, creating a dynamic cliff-face feature wall of recycled timber that was expertly crafted to fold and join along the changing angles above hanging displays. 7m high grey iron-bark trees, with natural beauty still intact, were installed in the shopfront which required special structural supports and coordination to ensure they were delivered and installed with minimal damage to the tree trunks. Inside, stained concrete floor finishes that resemble the Australian outback earth provides a warm, natural and dynamic floor finish. A feature black acrylic ceiling helps to enhance the height of the space and was built to carefully conceal all the ceiling services like air-conditioning. 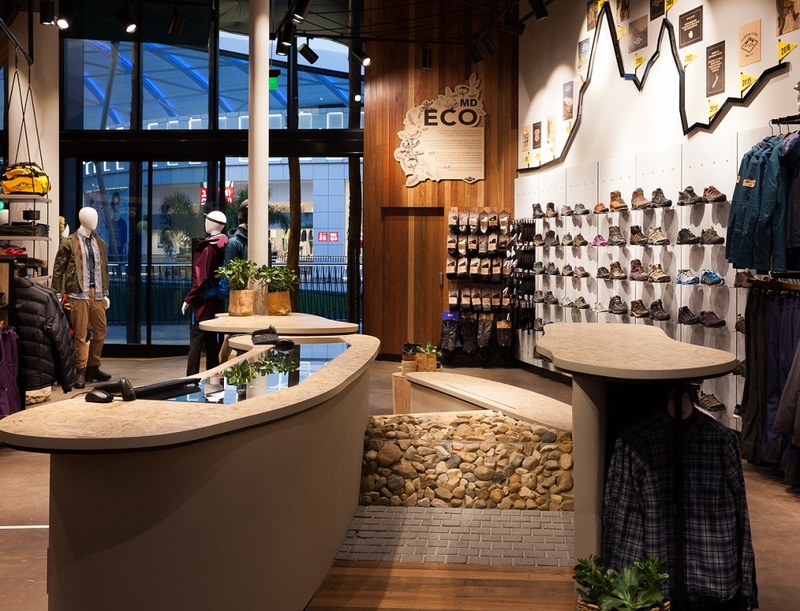 The hero of the space is an interactive sculptural element that contains a seat for trying on shoes, an adventure texture ramp for trying out your new hiking boots, hanging displays, floating shelves for merchandising and 2 side-facing point of sale stations that are seamlessly integrated flush into the counter. This bespoke joinery element also required a lot of coordination of services and solid construction to allow the textured surfaces to be walked over safely.